This is not the Red Sox system of yesteryear, nor did anyone expect it to be. Four months before the season began, Boston's Minor League talent pool took a sizable hit when four prospects, including top talents Yoan Moncada and Michael Kopech, were traded to the White Sox for All-Star left-hander Chris Sale. Three top-100 prospects remained after the deal. Two -- Andrew Benintendi and Rafael Devers -- are in the Majors; the other -- Jay Groome) -- was injured for much of the year and was fairly ineffective. But there were plenty rays of hope in the Minors. Devers' graduation from Double-A Portland to Boston showed that the pipeline is still capable of filling holes internally. 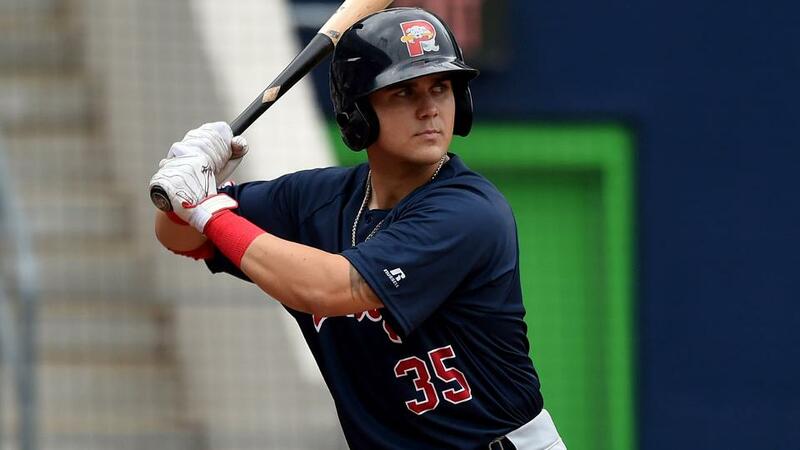 Michael Chavis' rise to MLB.com's No. 92 overall prospect showed that while there may not be a ton of depth, there is still quality talent. On the team level, Red Sox affiliates finished eighth among the 30 farm systems with a .512 winning percentage and Class A Greenville claimed its first South Atlantic League championship. Catcher -- Roldani Baldwin, Greenville (95 games): A former part-time third baseman, the 21-year-old repeated the South Atlantic League to make a full-time move behind the plate and took off offensively and defensively. Runners tested him often, but Baldwin threw out 33.1 percent of attempted basestealers, the second-highest rate among Sally League backstops. He also saw a big jump at the plate, particularly in the power department with 14 homers after totaling 11 long balls in his first three Minor League seasons. His .274/.310/.489 slash line solidified his spot as a SAL end-of-season All-Star. "He was certainly comfortable at the level, but his pitch selection improved and that's when we saw him really drive balls out," Red Sox vice president of player development Ben Crockett said. "The raw power had always been there; you could always see that. But it was a matter of translating that into games and transitioning to playing every day behind the plate. Once he got used to that, I think that's when he really took off." First baseman -- Josh Ockimey, Salem (100 games), Portland (31 games): The 2014 fifth-rounder entered 2017 facing questions about how consistent he could be for a full season after producing a .944 OPS in the first half last year and a .604 OPS in the second. Mission accomplished. The 21-year-old hit .275/.388/.438 with 11 homers, two triples and 20 doubles in 100 games with Salem, earning a promotion to Double-A Portland on Aug. 1. His numbers with the Sea Dogs (.274/.385/.436) were similar, and that's exciting news for a player who might have some of the best on-base skills in the system. His 83 walks ranked ninth in the Minors. "It really came down to him just doing the same things in the first half and the second," Crockett said. "Last year, he obviously got away from what had made him successful. He got a little bit more pull-oriented then. This year, I think we saw him show his more true colors and really play to his strengths, which are recognizing good pitches and allowing the power to play naturally." Second baseman -- Josh Tobias, Salem (21 games), Portland (92 games): The Red Sox acquired the 24-year-old switch-hitter from the Phillies for right-hander Clay Buchholz last December and he held his own in his first season in the organization. Tobias took off with a .345/.412/.494 line in 21 games at Salem before seeing those numbers take a hit (.268/.321/.352) at a more challenging level the rest of the way. Though he's yet to show much power -- he totaled five homers and 26 doubles in 113 games -- Tobias finished fourth in the system with a .284 average, and it's that hit tool that will drive him up the chain. Third baseman -- Michael Chavis, Salem (59 games), Portland (67 games): There's no doubt that Chavis was the most impressive Red Sox prospect this season. Start with the fact that he hit 31 homers, tying for fifth in the Minors and almost doubling his previous high of 16, set in 2015 at Class A Greenville. What's more, his 68 extra-base hits ranked third among all Minor Leaguers. "Absolutely, we saw the plus-plus bat speed and raw power early on," Crockett said. "I mean, he hit 16 homers and  doubles as a 19-year-old in Greenville his first season there, so we knew the power was there. But he showed much better pitch selection, allowing that great bat speed and loft to come in play. That's a big part of his development." But beyond just pop, the 2014 first-round pick became a solid overall hitter for the first time in his career and finished with a .282/.347/.563 line between his two stops. Part of that was the fact that Chavis finally was healthy after playing most of 2016 with a broken middle finger. With few injury woes and his confidence fully restored, the 22-year-old took off as one of the breakout stars of 2017 and will be one of the more intriguing prospects in the Arizona Fall League. Shortstop -- Chad De La Guerra, Salem (58 games), Portland (52 games): A 2015 17th-round pick as a senior at Grand Canyon University, De La Guerra became a name to know in the system, hitting .283/.361/.437 with nine homers, three triples and 31 doubles in 110 games between the Carolina and Eastern leagues. The 24-year-old made 84 starts at shortstop after playing mostly second base in his first two seasons and has a chance to be an adequate defender at the more demanding position. Outfielders -- Jeremy Barfield, Portland (92 games), Pawtucket (three games): The 29-year-old right-handed slugger was signed out of Sugar Land in the independent Atlantic League on May 25 in a move that was meant to bring outfield depth and experience to Portland. Barfield ended up being a lot more than that. Despite the late start, his 27 homers ranked second in the Eastern League, a circuit he led in slugging (.584) and OPS (.944). The Sox gave the former A's and Rockies prospect a brief look at Pawtucket in September, and he's expected to return to the International League after announcing he re-signed with the organization. "He definitely had a great season and by the second half was a really important bat in that Portland lineup," Crockett said. "We feel like he can be part of the solution at Triple-A again next year and, who knows, maybe the big league team in the summer. Sometimes power can be something that takes time to develop, and after the success he had at indy ball, there's no doubt he used that to make this his best season of affiliated ball." Bryce Brentz, Pawtucket (120 games): One of Brentz's best seasons in a Red Sox uniform might be his last. The 28-year-old outfielder was outrighted off the 40-man roster in March and responded by hitting a career-high and IL-leading 31 homers. His .529 slugging percentage and .863 OPS put him second in the Triple-A circuit behind only Rhys Hoskins (.581, .966). "First off, playing every day for him was big," Crockett said. "You could see him getting into rhythm without any long layoffs. He made a nice adjustment mechanically, too, with the coaches to get himself more on time at the plate with a bit of a toe tap. ... It was his most complete season at Triple-A yet, and that can only mean good things for him going forward." Despite the surge in his first 100-plus game season since 2012, Brentz wasn't added to the 40-man roster for the playoff push and will become a free agent this offseason. Tyler Hill, Greenville (119 games): Moving on from two powerful outfielders to one with a completely different skill set. Hill was solid at the plate, hitting .272/.342/.390 with nine homers with the Drive, but what truly stood out was his ability to steal bases. The 2014 19th-rounder led the system with 42 thefts -- 15 more than his closest competitor -- and was thrown out only eight times. That's a significant improvement from what he did on the basepaths in 2016, when went 11-for-22 in steals in 61 games at Class A Short Season Lowell. "Tyler did a really nice job when it came to the bases," Crockett said. "We encouraged him to test his himself and to test how aggressive he can be out there because that's a real learning experience. He got a little banged up at the end that may have limited the totals, but we're really pleased with his progress." Honorable mentions: Danny Mars won the organizational batting title and ranked fifth in the Eastern League with a .304 average in 119 games with Portland. ... Rusney Castillo -- Boston's $72.5 million signing out of Cuba in 2014 who was taken off the 40-man roster in 2016 -- was an IL end-of-season All-Star after hitting .314/.350/.507 with 15 homers and 14 steals in 87 games for Pawtucket. Designated hitter/utility -- Rafael Devers, Portland (77 games), Pawtucket (nine games): In perhaps any other organization, Devers would have been an easy pick for third base. Instead, he moves to the DH spot, simply because he spent less time in the Minors than Chavis did. The 20-year-old batted .300/.369/.575 with 18 homers, three triples and 18 doubles in 77 games before moving to Pawtucket on July 14. He lasted 10 days at Triple-A, then made his big league debut and did an impressive job of solidifying the hot corner for the big club in the second half. Honorable mention: Tzu-Wei Lin solved Double-A pitching in his third season at the level with a .302/.379/.491 line in 48 games before moving up to Pawtucket and, later, Boston. Always considered an impressive defender at shortstop, the Taiwan native also got time at second base, third and center field. Right-handed starting pitcher -- Hector Velázquez, Pawtucket (19 games, 19 starts), Boston (eight games, three starts): The 28-year-old right-hander signed with the Red Sox after seven seasons in the Mexican League and pitched well enough at Triple-A to earn multiple looks with the big club. Velazquez's 2.21 ERA over 102 innings for Pawtucket ranked second among IL pitchers with at least 100 frames while his 1.00 WHIP placed third. While he notched only 79 strikeouts, he issued 24 walks in 19 starts, a skill that stood out to the front office. "The biggest credit to him is how aggressive he can be with the fastball," Crockett said. "He's got some other pitches in tow to keep guys off-balance, but what always stands out is how he'll attack in the strike zone. His level of execution is something he brought from day one, and credit to our scouts, that's something he carried over from 2016 in Mexico." Honorable mention: Mike Shawaryn, a 2016 fifth-round pick, led the system with 169 strikeouts over 134 2/3 innings between Greenville and Salem. He posted a 3.81 ERA and 1.21 WHIP in 26 starts in his first full season. Left-handed starting pitcher -- Jalen Beeks, Portland (nine games, nine starts), Pawtucket (17 games, 17 starts): Named the organization's Minor League Pitcher of the Year, Beeks experienced a breakout of his own. The 24-year-old southpaw posted a 3.29 ERA and 1.21 WHIP over 145 innings between Triple-A and Double-A. Solid numbers, but what stood out were his 155 strikeouts. His punchout rate has risen steadily in each of his three full seasons, from 16.2 percent in 2015 to 19.1 in 2016 and 25.6 in 2017. "In 2015, he had a good fastball-changeup mix, but his breaking balls were less consistent," Crockett said. "Then, in 2016, he didn't have quite the feel for his changeup and had to rely more on the breaking stuff. That really helped all of the pitches develop to the point where they all clicked this season. The slider is better; the fastball is better; the curveball can get in the zone. It's a better package than it really has been before." Relief pitcher -- Bobby Poyner, Salem (16 games), Portland (27 games): The 2015 14th-rounder out of the University of Florida posted the numbers every organization desires out of its relief prospects -- a 1.49 ERA, 0.93 WHIP, .177 opponents' batting average, 84 strikeouts and 17 walks over 60 1/3 innings. He also converted 15 of 16 save chances between Salem and Portland. But what were perhaps most remarkable were the left-hander's reverse splits -- he held righties to a .145 average and .441 OPS in 169 plate appearances, compared to .250 and .654 vs. lefties. Those across-the-board numbers have earned Poyner a trip to the prospect finishing school that is the AFL. "He's got a neat three-pitch mix, but it's the changeup that's his best off-speed pitch," Crockett said. "He's fearless inside with it, and that allows him to go back and forth against right-handers better than most lefties. It was an impressive run, especially as he went to the higher level."